Cluster is a group of physical storage controllers. Each Storage controller is a cluster’s node. All nodes in the cluster can pool their resources together – data workload can be distributed across the member nodes. All communication and data trasfer between member nodes take place over a 10Gb cluster-interconnect network to which all nodes are connected (I mention that a little bit already in NetApp – Clustered vs 7-mode Scaling post). A cluster is typically build upon one or more HA pair. HA (High Availability) pair is a setup of two storage controllers in which both nodes are actively host and serve data, but they are also capable of taking over their partner’s job. All disk shelves in HA pair are cabled to both controllers. Such configuration is not required. As I mentioned in my previous post (Clustered vs 7-mode Scaling) there can be even single-node cluster configurations. However to ensure the best quality and stability production clusters are almost always build upon HA pairs. 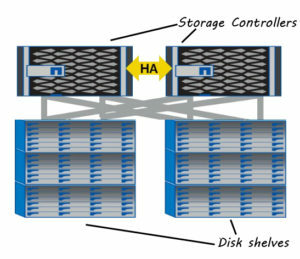 Single node cluster is a special confiugration that supports small storage deployments. ONTAP 9 that only serve NFS and/or CIFS data (often called NAS clusters) can scale-up to maximum 24 nodes (in other words cluster can be build up 12 HA pairs). cluster that hosts iSCSI and FC (often called SAN clusters) can scale up to a maximum of 8 nodes. The limit can be lowered – depending on the hardware controller model. In my example there are 3 HA pairs: nyc_node16-nyc_node17, nyc_node25-nyc_node26, nyc_node27-nyc_node28. ← NetApp cDOT – How to create a snapshot schedule?